It's astoundingly simple. According to your specifications, ARAMYST monitors Pitchblue and Pathfire syndicated content delivery systems for the content you want. You can acquire programs any number of days in advance and keep them on the server for as many days as you specify and ARAMYST will automatically delete them after that period is up. When ARAMYST sees your program on Pitchblue or Pathfire, that's when it works it's auto-magic. It will automatically record and rename the program according to your station's naming conventions. It then automatically segments the program, schedules your media events, and is ready to air. This is what takes ARAMYST from a time and money saver to a revolution. The system knows to segment out content, barter, and blank space for local commercials. According to the rules you specify, ARAMYST automatically inserts your station bug during programming, pulls it out 5 seconds (or the number of seconds you choose) before rolling a segment containing a national commercial, and then puts it back in that many seconds after the program resumes. It does this automatically, every time, so you don't have to worry about showing station ID or accidentally displaying your bug over a bartered commercial. This image shows ARAMYST's automatically generated timeline on NVerzion's NFinityView QC tool. ARAMYST pays for itself in months. In a standard workflow, operators can spend up to 30 minutes preparing a 30 minute Pitchblue program and up to 60 minutes preparing a 30 minute Pathfire program. With ARAMYST running, you will be hard pressed to spend even a quarter of that time managing your syndicated programming. 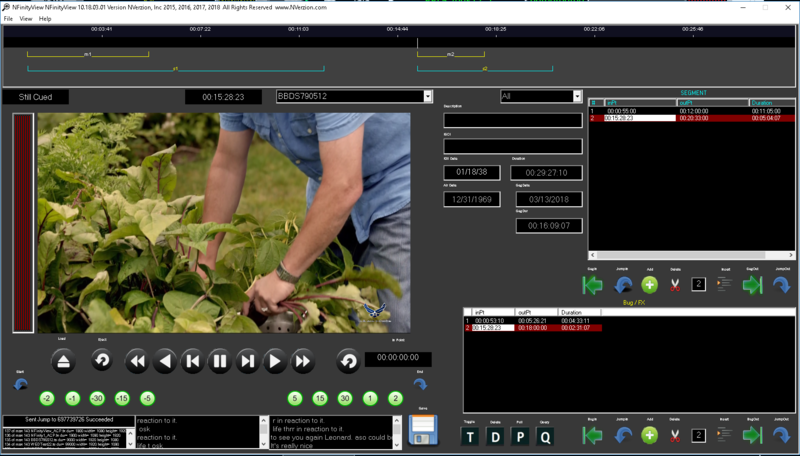 ARAMYST is built using NVerzion's NFinity Broadcast Video Server and shares the same technical specs. To view the technical specifications, click here. © NVerzion 2018. All Rights Reserved.